Yesterday I gave my boyfriend a birthday present I have spent approximitely 25 to 30 hours working on. 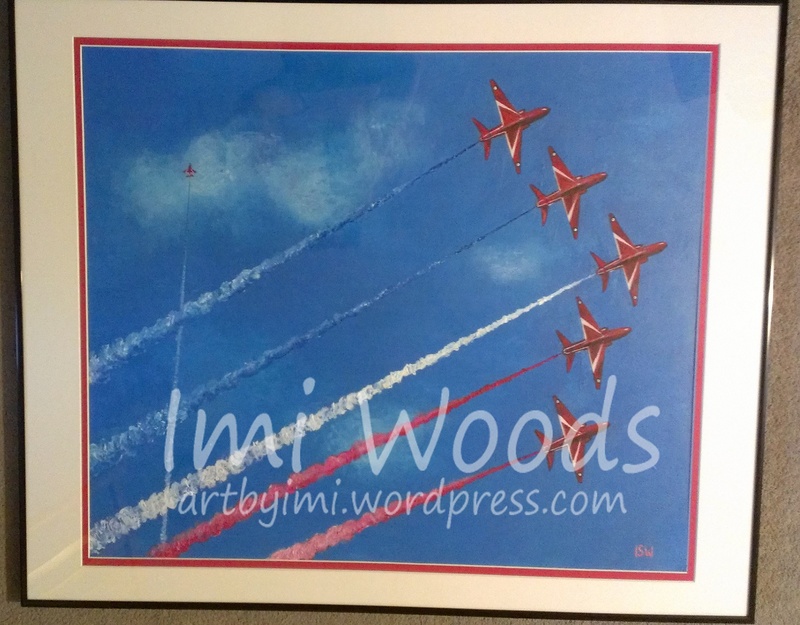 It is a painting of the red arrows and is now framed in 130 x 90cm frame. Took 2 rolls of wrapping paper and quite a lot of team effort. Best girlfriend ever award I think. Voila, my picture, it is now in pride of place on his wall! In other news, I saw a health specialist last night and I still have a way to go. Thankfully, I am in a much better place to deal with it now as I am so much happier and less stressed. I will use painting as well as sleep and healthy food and supplements to nurse myself again. And smiling and laughing again. That comes much easier now! my first genuine (ie not family / friends) commission has come in! I am to paint a ring-tailed lemur for a colleague at work as a gift to her husband for their first wedding anniversary. Hopefully now I have broken into the work scene, more of my colleagues will be interested! I will be sure to hand it over in a loud vibrant fashion and attract a crowd!! ie if they buy a painting they can still afford to eat. I will start the painting early next week as I am a busy bee this week with company induction. I will post regular updates and photographs of my painting in progress; explaining how I am doing it and giving hints and tips. and the key to being happy and healthy is not worrying too much. I’ve even volunteered at an art therapy workshop before. For the members, expressing themselves through art – and giving their minds a chance to be clear and focused for a while – all contributes to their healing. A while ago I set myself a challenge of doing ten paintings throughout 2012.
but it took a lot out of me. Painting is the one thing I don’t worry about, simply because it has never let me down, and never ceased to make me feel good about myself. First hurdle: 7 more paintings in 4 months. Sounds doable? With the biggest hurdle, I’ve found that often the trick is trying not to try too hard. Painting helps me with that.